Adele’s latest album “25” was finally made available for streaming through Apple Music, Spotify, Tidal, Amazon Prime and other streaming services on 24th June, 2016, over seven months after its initial release. 25 is the third studio album by British singer and songwriter Adele. Since its release on 20 November 2015, the '25' instantly became one of the best-selling albums ever, moving over three million copies in a single week. Before the album is available for streaming, only 3 singles, "Hello", "Send My Love (To Your New Lover)", and "When We Were Young", were made available to stream on Apple Music and Spotify, as a promotional effort. But now, the full '25' album is finally headed to streaming services. Now, let's download the album from Apple Music and enjoy it on your devices. Open iTunes and go to the Music > New tab. Search 25 to find the album. Add the music or playlist and click the "..." button to add the music to "My Music" or "Playlist". Go to "My Music" tab, and click the added music. Click the cloud icon with a downward arrow next to the song to download it for playing offline. 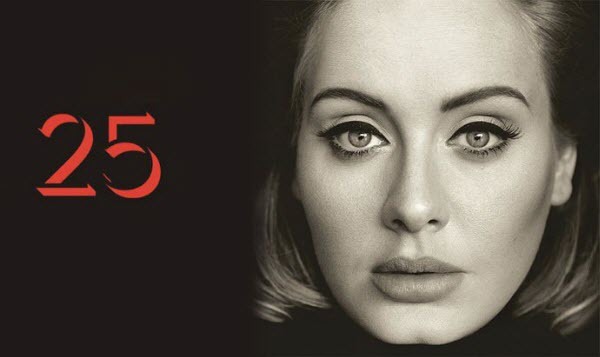 Do you want to enjoy Adele's '25' in your car via USB flash driver? Do you want to burn the album to CD for enjoying? Do you want to keep the downloaded album even after cancelling subscription to Apple Music? Yes, sure I am. However, Apple Music songs are downloaded with DRM protection, which prevent you from transferring them to USB, burning to CD and keeping them forever. Luckily, there comes NoteBurner iTunes DRM Audio Converter to help you remove DRM from Apple Music songs. Thus, you can do whatever you want with Apple Music songs. How to remove DRM & Convert Apple Music files to MP3? NoteBurner iTunes DRM Audio Converter (For Windows | For Mac) is an professional and multi-functional iTunes audio converter, which integrates Apple Music Converter, Audiobook Converter and M4P to MP3 Converter together. It can help users convert DRM-ed Apple Music files, M4A/M4B/AA/AAX audiobooks and M4P songs to plain MP3/AAC/FLAC/WAV at 20X faster speed with lossless quality. Step 1: Launch iTunes DRM Audio Converter on Mac. And then click Add button to add Adele's '25' to the program. Step 2: After adding, all your added songs will be listed in the main interface. Click the setting button to choose output format and output path. Output format as AAC, MP3, FLAC, WAV are available to choose. Also, you are allowed to choose conversion speed. Generally, 20X is highly recommended. Step 3: Now, all you need to do is to click the "Convert" button. Your music files will be converted at 20X faster speed with all ID Tags and Metadata kept. Step 1: Launch iTunes DRM Audio Converter on Windows. Click "Add" button, then you will see a pop-up window which will show you all the iTunes folders. You can add songs of Adele's '25' to the program. Step 2: Click the "Setting" button on the main interface, and then there will be a pop-up window which allows you to set output path and output audio format. Output format as MP3, WAV, FLAC or AAC are available to choose. Step 3: When finish customization, click "Convert" button to start converting. 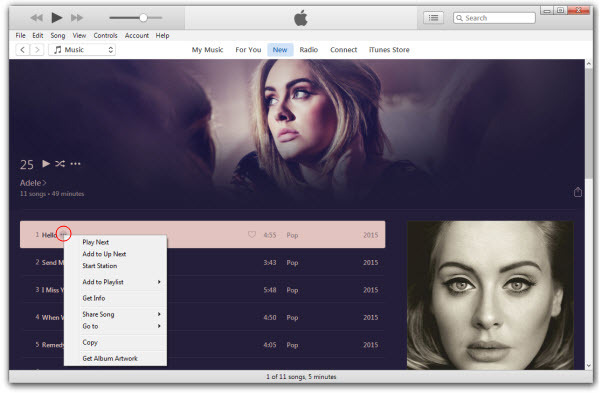 With three simple steps, you can remove DRM from Apple Music songs. Then, you can move Adele's '25' to USB for enjoying in the car, burn it to CD or keep it forever even after cancelling subscription.